It has now been thirty years since former British Prime Minister Margaret Thatcher gave voice to her famous and equally senseless idea that: ‘There is no such thing as society.’ In the Chinese Communist Party’s quest to eradicate ‘Western ideas’ from the realm of discourse in China through the ‘seven prohibitions’ (qi bu jiang), Xi Jinping is likewise denying the existence of a society, by arguing that a civil society is nothing but a mere concept, and even a trap set by the West. Thatcher and Xi’s ideas are equally senseless and equally ideological in their quest to deny the obvious. While the denial of the very existence of a civil society is not new in China, and Xi Jinping is not the first to have devised this type of propaganda (it was already referred to as a ‘trap’ by the former Hu Jintao administration), the ‘trap theory’ today is closely linked to the propaganda surrounding the ‘Chinese Dream’ (zhongguo meng). In the myth of the American Dream, it was once said that: ‘What is good for General Motors is good for America and good for you.’ In February 2013, The People’s Daily made a direct reference to the American Dream when stating that the Chinese Dream promotes the concept that ‘what is good for the country will be good for individuals.’ While holding to the assumption that the Chinese Dream diverges from its American counterpart, the party-state basically promoted the same myth about the dream’s alleged benefits for ‘the people’. Ideological references to ‘individualism’ and ‘collectivism’ aside, the respective ‘Dreams’ are, of course, the dreams of the rich and the beautiful. Like in America, many Chinese fall outside the dream with no chance to ‘get rich first’, as was the original slogan put forward by Deng Xiaoping. The present propaganda texts emphasise that the Chinese Dream is the dream of all Chinese, in particular the ‘Dream of the laobaixing’—the ‘old one hundred surnames’, or the people themselves. Of course it is all basically an emperor’s dream, and very much as is the case in America, the people who fall outside the grand dream tend to organise themselves in ways outside the legal rules and accepted norms in an attempt to reach the overarching cultural norm of prosperity that ultimately underpins the dream in the first place. In many such cases we are not even speaking of getting rich, but merely of getting by. The sociologist Robert Merton wrote about those excluded by the American Dream as far back as the late 1930s. One of his main findings was precisely that people who could not achieve the dream of personal prosperity by the restricted avenues of legal means and norms would simply try to achieve that aim by illegal means. And why shouldn’t this be the case in a China that has moved from one of the most equal to one of the most unequal societies in the world in just a few decades? According to recent World Bank statistics, China has seen the GINI coefficient—the statistical estimate of relative equality and inequality—moving up from an equal 0.21 in 1978 to an estimated highly unequal 0.61. The Chinese people and their ways of organising themselves in the face of this reality is tangible and no imagined theoretical ‘trap’. The paradox of trying to prevent a civil society from organising itself from the grassroots in any legal manner has seen the unintended consequence of a rather uncivil type of society emerging from the bottom of contemporary Chinese society. The examples of such phenomena are too many to describe here, but let me take just a couple of examples from my new book Crime and the Chinese Dream (forthcoming in February 2018 with Hong Kong University Press). In the countryside, we see the emergence of a virtual criminal economy among the excluded. Earning money by illegal means has become common as the only way to ‘get rich’ or even just get by, and many parts of the countryside have come to be described as an ‘underworld countryside’. So-called ‘criminal villages’ (fanzui cun) and criminal towns have emerged as people on the margins are struggling to fulfil the dream of relative prosperity in the only way available to them. In Fang Village in the south-east, so-called ‘cake-uncles’ (bingshu) are running grand scams by carrying out sales with falsified account books—extending their fraudulent activities across China and making the village prosperous. The new mansions in the village are all built and owned by the fraudsters. The village girls all want to marry a ‘cake-uncle’ instead of a toiling peasant. The story is one where the village struggled with all kinds of legal means to gain prosperity before they found their criminal and profitable trade. Fang Village is not alone. A map of criminal villages in China shows a diversity of criminal activities from fraud, organised large-scale shoplifting, car theft, and burglary. In one much publicised example, a robbery village in Guangxi specialised in hand-cutting as a means of creating chaos and then utilised that chaos to rob people in the panic after their blood-letting attacks. The village robbers typically attacked crowded places like train stations or other locations where many people had gathered. The culprits then robbed and fled in the mayhem created by the incident. Other examples we can read about include drug-producing villages where the whole local economy is based on drug production and transportation, typically in poor provinces like Yunnan and Guangxi in the south-western drug belt areas. There are also weapon-making villages trading in illegal firearms. The list of criminal entrepreneurialism is diverse and wide ranging. I have recently been involved in a project that looks at child kidnapping. The project has identified villages that base their local economy on the kidnapping of children for profit. We found that the children are typically under three years of age, and that there is a clear ‘division of labour’ among traffickers. The last link in the on-the-spot act of kidnapping is often an old woman who may look like the grandmother of the screaming kidnapped child, not creating any suspicion about the crime being committed. After the kidnapping, other perpetrators stand for the storage, transport, and final sale of the kids. The entire process is extremely well organised, with the police involved occupied looking in other directions. In this example it is worth noting that impunity is the rule for the kidnappers, and that the civil society occupied with organising and petitioning activities among parents is cracked down upon far more readily and effectively than the ‘uncivil’ organisations and networks in the criminal villages. The few solved child-kidnapping cases are shown on a special national TV show as ‘proof’ of the effectiveness of the police. Parents, however, are not able to have the TV station run any unsolved cases, as the show only allows happy stories to be aired. A snapshot from the ‘uncivil’ reality of the cities can be illustrated by a short stroll over a narrow footbridge in Guangzhou. I counted no less than two hundred and fifty illegal posters and stickers offering everything from false documents and stolen goods, to sexual scams and job ads for prostitutes. This is typical for many public spaces in the city—in the outlaying rural areas, the suburbs, and the central business districts. All posters, stickers and painted messages come with a mobile phone number that is impossible to trace by the police, and the high-ranking policemen I spoke with said they do nothing about this unless there is a genuine complaint from the public, and even then is there is not much that can be done. The regular police even blame the urban management teams (chengguan) for being responsible for the criminal posters problem. The chengguan on their side believe that it is the duty of the police to take down the posters, so they simply let it pass and refuse to do anything about the problem. The uncivil society, thus, has free advertisement walls all over the city and with a nearly one hundred percent chance of impunity. If the Cultural Revolution had its ‘big character posters’ (dazibao), and the late 1970s and early 1980s had their ‘democracy walls’ (minzhu qiang), the Chinese Dream era has its own criminal poster walls (as well as bridges and all kinds of public spaces) with free ads for criminal activity. Such posters more or less dominate many cities in China today, and this kind of ‘uncivil society’ is allowed to spread. The walls are typically plastered with private commercial posters, job ads, and all kinds of announcements, legal and illegal alike. On many walls, recruitment posters for the army and the brothels stand side by side. 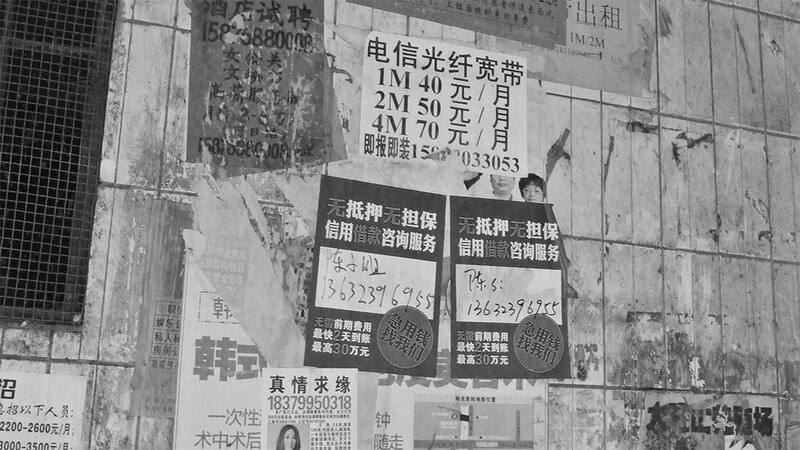 The picture that accompanies this article shows several typical criminal posters, like the frequently displayed big red poster ads for recruiting male money boys and female prostitutes (concealed with inventive ‘job descriptions’ such as ‘secretary’, ‘PR-consultant’, ‘service worker’, ‘housemaid’ etc.). The job categories are easily recognised by the people in question as describing different forms of prostitution with promised earnings of up to sixty thousand yuan per month. Another poster at the bottom left of the photo pictures a beautiful twenty-nine-year-old woman accompanied by a scam story of an unhappy marriage and a rich husband’s accident leading to the couple not being able to have a child. Half a million yuan (!) is promised to the person who can make her pregnant (after paying a ‘small fee’ of one thousand and two hundred yuan to the couple’s alleged lawyer). My colleague who speaks Cantonese with a northern accent phoned the number, met a woman on the line, and set up an appointment to meet her alleged lawyer at a hotel lobby the next day. He never went, but the scam became clear to us. The ‘lawyer’ would disappear as soon as the fee was paid. I asked a policeman if people really buy this scam, and he confirmed that many do, and that they never receive any complaints because the betrayed ‘inseminator’ never dares come to the police with his foolish mistake. This type of scam has almost no chance of being targeted by the police, and this is well known among the perpetrators. Capitalism has come to China in the grand package of a Chinese Dream, and the crimes that follow are covered up by massively falsified crime statistics. According to data gathered a couple of years ago, in Guangzhou alone the real numbers of crime known to the police are falsified down to 2.5 percent in the official statistics, while 97.5 percent is concealed to the public. The falsification of numbers concerns petty crime as well as serious violent crime. The government is no longer fully in control of crime and ‘uncivil’ entrepreneurialism, but they care more about controlling the alleged ‘trap’ of civil society. In short, petitioning is more important to control than kidnapping. This situation recalls what Marx and Engels wrote in their Communist Manifesto about bourgeois society—that it is ‘like the sorcerer who is no longer able to control the powers of the nether world whom he has called up by his spells’. Both economies and norms change in this spiral of capitalist economic development (with Chinese characteristics), giving rise to ‘uncivil’ forms of entrepreneurialism. In such a whirlwind, the ‘nether world’ in Marx and Engels’ account may well translate into the ‘uncivil society’ shown in the criminal villages in the countryside and the criminal posters on the city walls. Photo: Criminal poster wall in Guangzhou (Børge Bakken). This article was originally published on Made in China, issue 1, 2017. 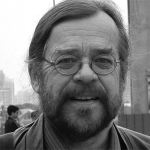 Børge Bakken has worked at Oslo University, Copenhagen University, Harvard, Ludwig Maximillian Munich University, Hong Kong University, and the Australian National University. He has written extensively on sociological and criminological issues in China. Among his books are The Exemplary Society (Oxford University Press, 2000) and Crime and the Chinese Dream (Hong Kong University Press, forthcoming in 2017).